Throughout the over-the-air digital transition cable companies made a point of advertising how it wouldn't affect cable customers. 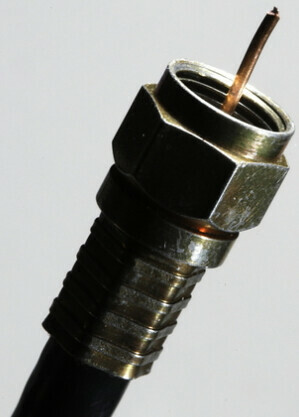 While part of their message was focused on how that they were already providing their customers cable boxes, they also tried to reach out to people who were reluctant to buy converter boxes by telling them that they'd still be able to plug their cable straight into their TV's like they were used to. NOTE: This is a guest post by Scott. Basic guidelines for writing and submitting a guest post at GeekTonic can be found here. While, it may have been true at the time, it was also a bit of a disingenuous claim as the entire time the cable companies knew that someday very soon they'd be doing the exact same thing. And, at least up here in Seattle, that day is here. Now, I know for us HTPC enthusiast this has lots of game changing implications but, at least for this post, I'm not going to focus on those. For today, lets just start with the why. 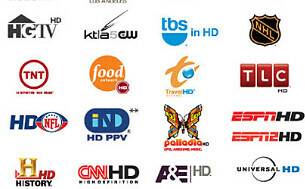 So why are cable companies going to all the trouble of removing most of their analog channels? I mean when you think about it the process is ridiculously complicated, they'll be flooded with calls from confused customers, and they'll have to give out millions of free DTA converter boxes. Does any of that sound like something your cable company would go out of its way to do? And yet they're doing it anyway and I can explain why in just two pictures and one word: bandwidth. 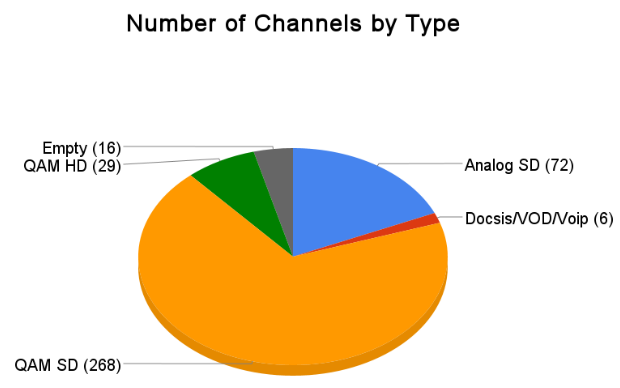 This first pie chart shows the percentage each channel by type. Now this is just for my Comcast Cable here in Seattle, but I'd imagine that it'd be roughly the same for most digital cable systems, give or take a few HD channels. The thing to take away from this chart is the huge difference in the number of QAM SD channels is vs the number of analog SD channels. 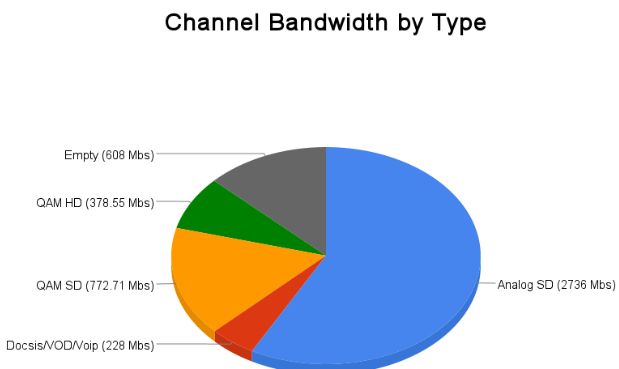 Now this second pie chart shows percentage of the total bandwidth on your cable network being taken up by each channel type. Take a look at how much of the total bandwidth the analog channels are taking up, almost 60%, despite the fact that they only make less than 25% of the available channels. And what makes it even worse, everyone of those analog channels is also being simulcast with a digital version in SD and, in some cases, even in HD. 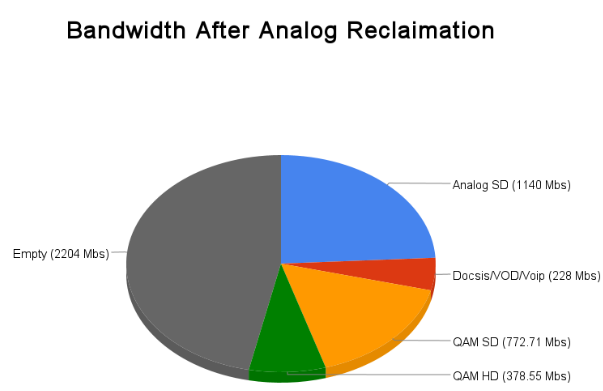 So that means that the 772.71 Mbs of SD QAM bandwidth shown in the chart above not only already includes the all of the analog channels but also adds 193 additional ones while using 350% less bandwidth. So now that we know the when and why, the next big question is what, as in what's going to happen when cable companies have all this free bandwidth burning a hole in their pocket. What are we as consumers going to get out of all this? We're effectively being forced to give up the convince of Cable Ready TV's that we've enjoyed for almost two decades so what do we get in return? And how about the cable companies themselves, what kind of cost cutting and competitive opportunities is this going to open up for them? Tune in next time to find out why I think this is a very good time to be a cable customer. About Scott: Scott is all about digital video. Professionally he spent 3 years writing software for digital cable test equipment and another 2 as a software tester for HD-DVD. And, as a hobby, he's been tooling around with his HTPC for almost 6 years and occasionally contributing a plug-in on SageTV forums. He resides up in Seattle, WA where he works as a software/hardware engineer at Microsoft.